Long time readers will note that I generally don't like to review 7 or 8 figures in one shot. Oh, I've done it before, but that doesn't mean I think it's a particularly good idea. Likewise, I don't like to break a wave of figures up into 7 or 8 single reviews - good God, man, nobody needs that much detail. But I'm making an exception tonight. DC Universe wave 7 has been out in some parts for quite some time, so I'm pretty late to the party. In fact, this wave has been around for so long that I bet we see wave 8 any day now. But I couldn't find the complete wave around these parts, and still haven't. I've seen three - Captain Cold, Kid Flash and Aquaman - but that's been it. So I had to wait for my Corner Store Comics order to ship, and with Mattel having one issue after the other with case packs to online retailers, it took awhile. But now they are all here, and I'll cover the whole lot at once. Don't worry, I'll do my best to be brief, although you know how hard that is. 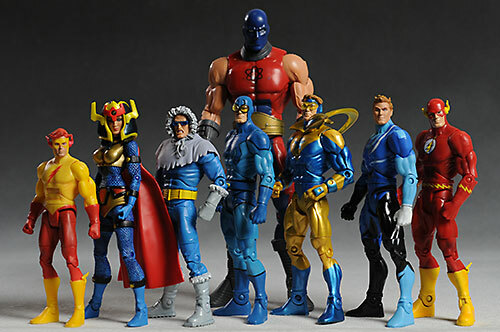 Other than the seven main figures (Big Barda, Aquaman, Blue Beetle, Captain Cold, Flash, Kid Flash, and Booster Gold) there is a BAF (or CnC as Mattel likes to say) of the Atom Smasher and two variants: Barda without her helmet, and a second Booster Gold. These have shown up at some select Wal-marts, and have hit Toys R Us stores as well. I don't know if they've made an appearance at Target or Meijers yet, but they should eventually show there faces there too. Expect to pay around $10 a pop. Some online retailers have them as well, and I have some sponsor suggestions at the end of the review. 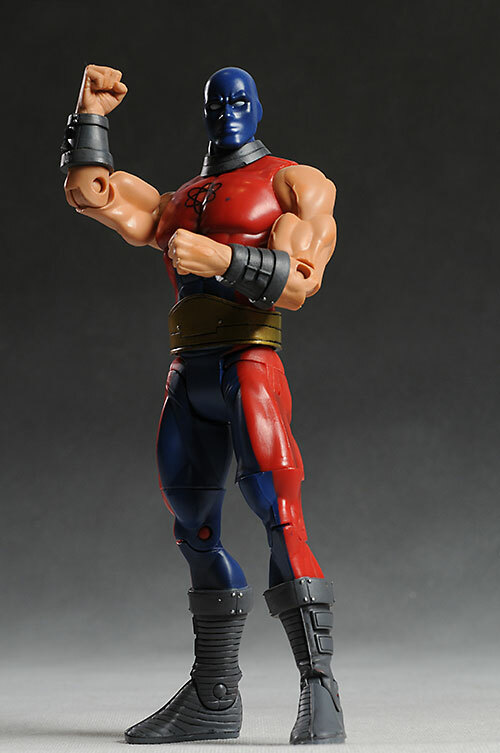 As a note, I'm going to be including the Atom Smasher Collect and Connect figure as just one of the guys in this review, rather than covering him only as an accessory, or as a separate entity. If you've seen the previous waves, then you know exactly what the packaging is like. Very little waste, a reasonable description on the back (including a photo of the entire wave and BAF), but it's not particularly collector friendly or easy to store. 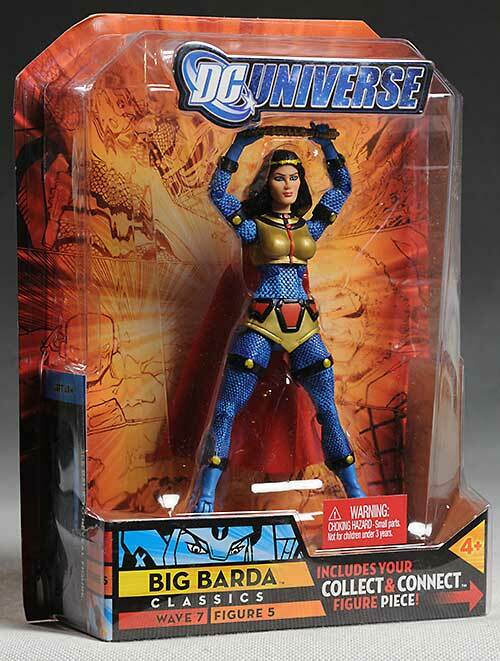 The package shot shows you the alternate Barda, btw. She comes sans helmet, and is likely to be the hardest figure in this wave to come by. 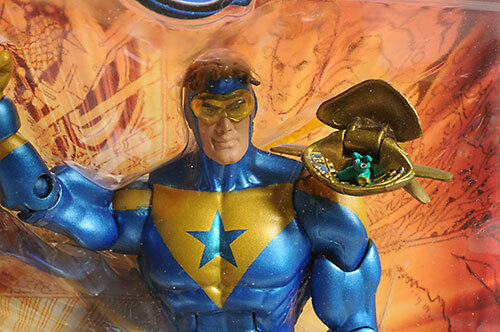 I also included a shot of the alternate Booster Gold, showing the opened ship. Of the entire set, Barda and Atom Smasher are my favorite sculpts. Barda has a beautiful face (something so few female action figures seem to have), and the sculpted detail on her costume is great. The smooth metal-like armor is offset nicely by the textured blue sections, and the looks terrific. She stands about 6 1/4" tall, which I suspect some might consider too short, but I'm good with her scale next to the others. Atom Smasher turned out even better, even though he's a fairly basic figure. While the basic body is fairly straight forward, it does have well sculpted musculature and veining. The detail work is added on the boots, bands and belt, where small rivets, grooves and textures are added. He stands just over 9" tall. 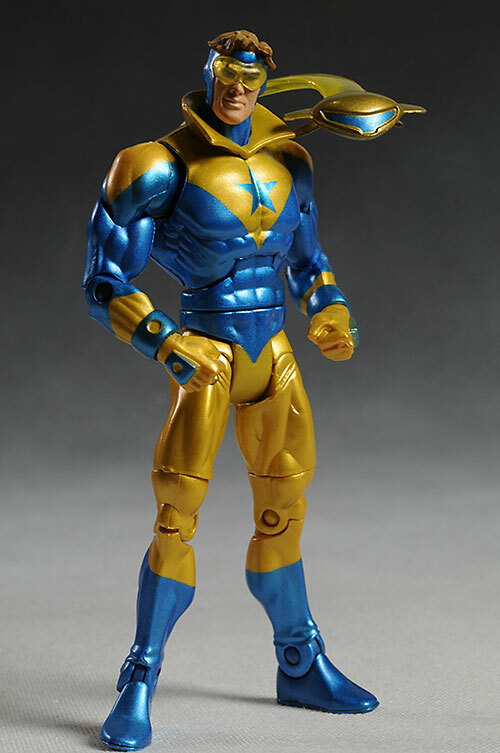 Another great sculpt is Booster Gold. In general, I like this figure much more than I expected, and the hair, face and Skeets all have excellent detail work. The tousled hair around his mask looks fantastic, and is one of the best hair sculpts I've seen in this scale in some time. Booster Gold clocks in at 6 3/8" tall. The design of Skeets, with the small ship 'flying' from around his shoulder on sort of an energy trail, works great. I would have preferred if you could pop it out of his back (on mine you can't, at least not without using something to soften the glue, but some folks have reported getting it out easily), but that's a minor nit. The energy trail looks great, made from a translucent plastic similar to his cool looking goggles. 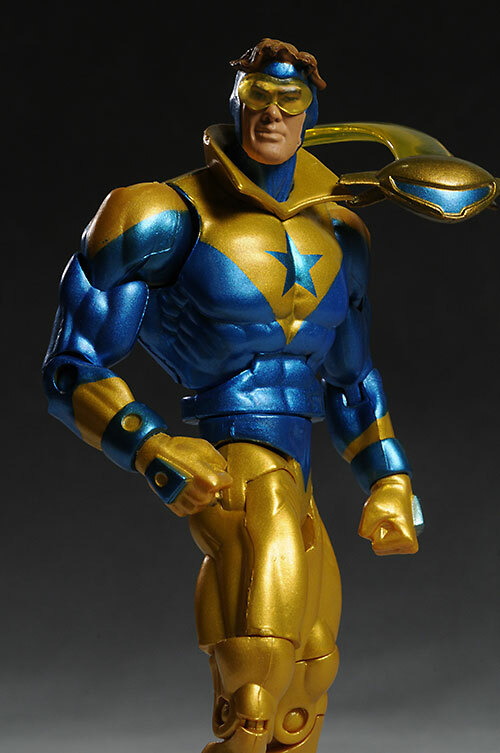 The 'regular' Booster Gold is the classic look with the collar, while the more Modern appearance, sans collar and with a Skeets that actually opens, is supposed to be the 'variant'. It appears that they are evenly packed though, so you should be able to find one as easily as the other. 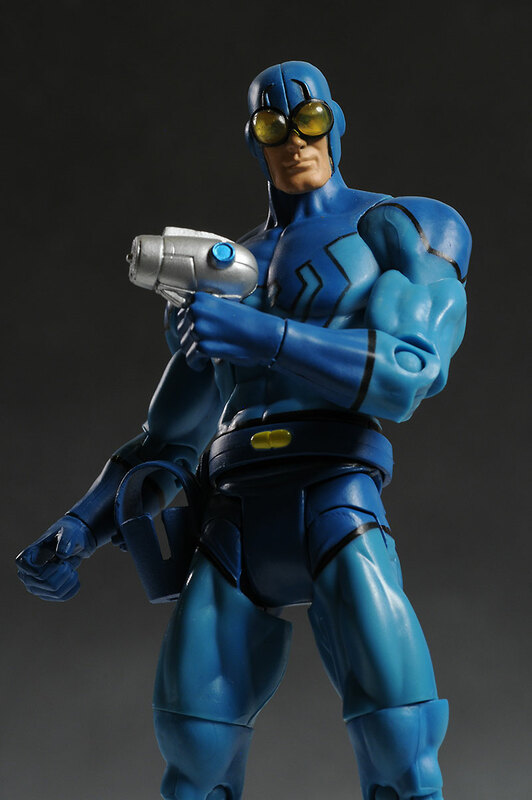 Another figure not to overlook is the Blue Beetle. He doesn't have a ton of sculpted detail, relying mostly on the paint scheme to differentiate the re-used parts, but the holster and belt look great, and the gun fits snugly in its intended home. The goggles are his best feature, and the translucent plastic looks great. He stands about 6 3/8" tall. 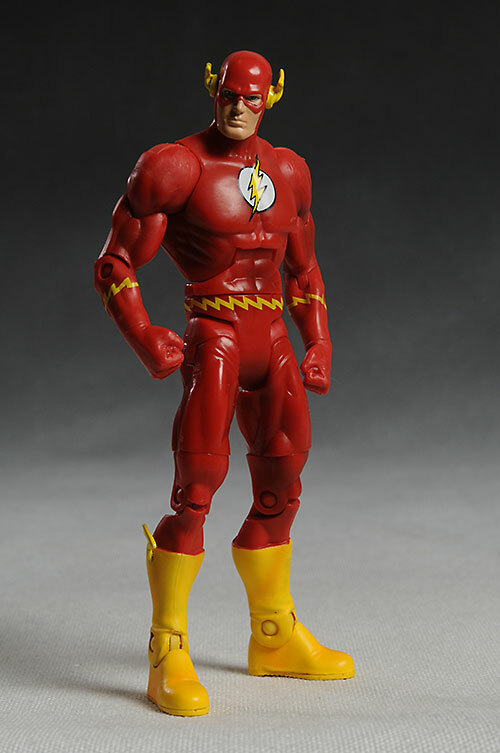 The Flash uses this same standard body, with some minor re-decos. There's the sculpted wings added to his head and shins, made from a softer plastic. Like the others made from this standard body, he's about 6 3/8" tall. Next up is Aquaman, another figure that large depends on his paint job - and what a paint job it is! - to stand out. In fact, this looks just like the wave 3 head, popped on that mid-sized body. 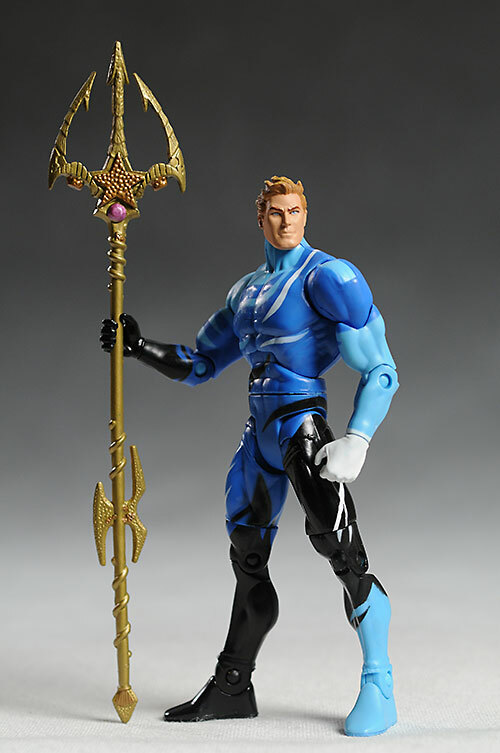 Like the recent MOTUC Faker, he's pretty much just a basic repaint, right down to the trident accessory. That's not going to do him any favors here, but I also had an issue with the mold lines along the shoulders, which seemed more obvious on him than the others. He stands at the same 6 3/8", as you'd expect. 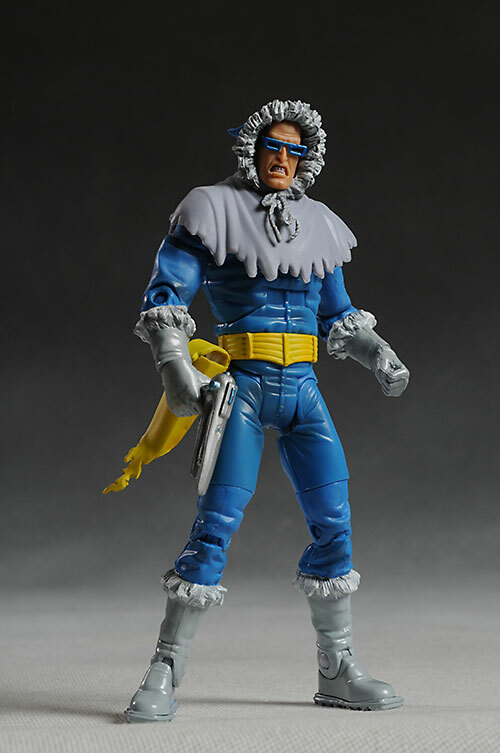 Captain Cold has some terrific detail work around his fur trim. The poncho-like cloth draped over his shoulders looks great, and he even has treads on the soles of his boots. I'm not a huge fan of the goofy expression - gritted teeth never look right to me - but I could live with it. So why the lower score than everyone else? For the same reason poor Sinestro ended up with a lower score - he's too short! I'm not talking a little too short, I'm talking noticeably shrimpy. Even with the parka hood, he's only 6" tall, and that 3/8" of an inch is very obvious. It's not just the fact he's shorter, but that the body is proportioned around the smaller stature, making him seem quite small overall. If the height or scale issue isn't as big of a deal to you, I'm sure your score would be higher here. Also, I didn't dock him for it as much as Sinestro (who only got **1/2 stars in this category) because he has some much more detail work on his outfit that helps make up for it. Finally, there's Kid Flash. Yea, he's shorter than the rest, but the 'kid' part of his name should explain that. This is the smaller body, and he's only 5 1/2" tall. This shorter stature looks about right for this character though, or at least as close as you'll get with mass market action figures. There's not much detail work to him, with the only extras being the wings at the shins and head, just like the regular Flash. Keep in mind that all the normal sized male figures here - Flash, Beetle, and Aquaman - share the same torso as Booster Gold. Skeets is coming out of his back on an energy trail, attached in the small hole in the center of the back, but the others simply have the hole plugged. It doesn't bother me, but you may find it more visually distracting. EDIT: Actually a reader pointed out that the chest piece on Flash and Beetle do seem slightly different than Booster Gold and Aquaman. However, the point about all having the hole with all four is still valid. The paint ops vary here by figure, much like they have with past waves. 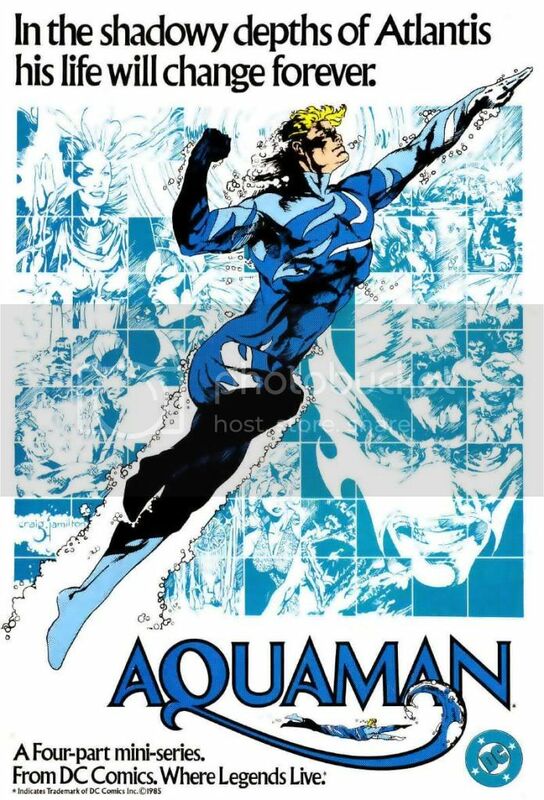 The best of the bunch is Booster Gold, with Aquaman bring up the rear. There's some weak cut lines on figures like Atom Smasher or Barda (most noticeably on her helmet), and some errant marks on a couple others. Both Kid Flash and Flash show the usual issues when trying to do red and yellow together, but they are certainly above average as well. My surprise favorite here is Booster Gold, who has a really well done paint job. It was particularly tricky too, because bright metallic colors like these tend to bleed and show bad cut lines even more than regular, more muted colors. 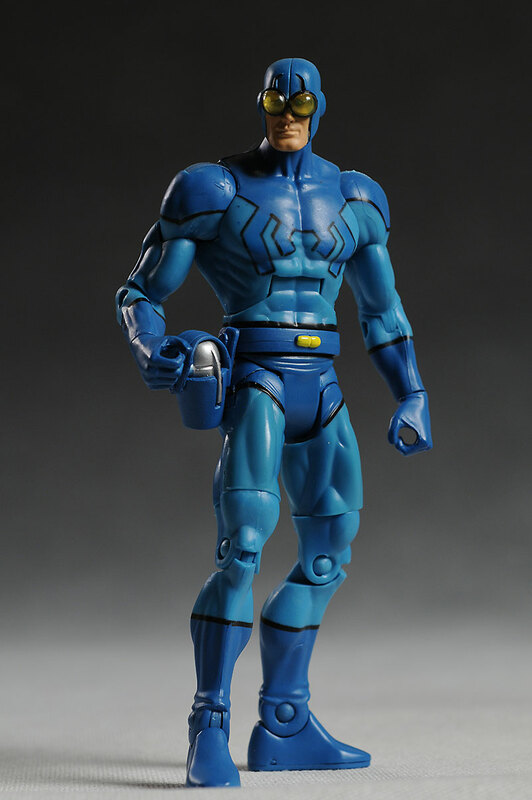 Don't over look Blue Beetle either. He's got a snazzy outfit with great cut lines, and I love the two tone look. Aquaman scored lower not because of any serious quality issue, but because of the goofy outfit colors. What is he supposed to be, the new mascot for Ocean Spray Cranapple Juice? A reader pointed out that this was a design from the 80's...I should have known. Even ignoring the weird colors, there is one quality issue that really bugged me. The disc in his left shoulder is the same aquamarine color as the one in his right shoulder. I don't know if this is just a production screw up and they actually had discs in the darker blue, or if they just cheaped out, but either way it's distracting, even on a costume this gaudy. The key take away here is that the overall quality of the paint is up on this wave, certainly from what we saw on waves 3, 4 and 5. These ARE mass market toys however, so getting a bad one now and then should be expected. Take care if you're picking them out on the shelf! The more I played around with these, the more I liked the articulation. I had a couple issues with loose hips at the start, but I found so many good poses for them that my concern dropped off quite a bit. Everyone has a ball jointed neck, although on certain figures (like Atom Smasher), it works amazingly well, while on others (like Barda), the sculpt or design restricts it a bit more. The all have ball jointed shoulders too, based on the usual peg/post/disc design. They all have joints on both sides of the ball too, although Barda's cut joint is a little lower on the arm. All the figures also have single pin elbows, knees, and ankles, along with cut wrists, cut waist, cut thighs, and an ab crunch. All these joints worked great, with a good range of movement and design. 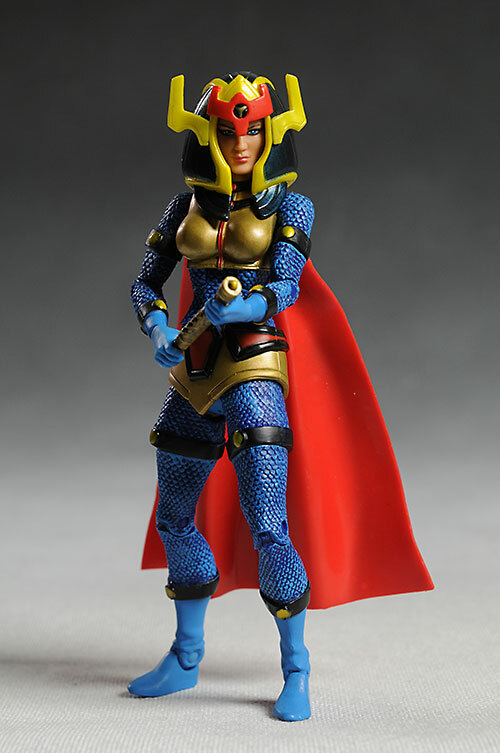 Finally, the all have the swivel hips that this line has made popular, including Barda. Hers is a bit more restricted than the others by the armor skirt, but it's less of an issue than you might think. These hips were the one joint that were a bit loose, especially on Barda and Smasher. I was still able to get them to pose quite well, but it's worth noting. I think Mattel has managed to hit just about the perfect articulation here - enough to give you great poses, and none of it useless or gratuitous. Unlike the previous wave where I had several figures with frozen joints or breakage, I didn't have ANY of those issues with this entire set of eight. In fact, had the hips just been a hair tighter, another half star would have gone to all of them in this category. I've actually broken this up into two scores, since whether or not you want the Collect and Connect figure of Atom Smasher can make a huge difference. Several of the figures come with nothing but the BAF piece, including Booster Gold, Kid Flash and Flash. If you won't be buying the entire set to build the additional character, then these pieces are worthless to you. However, figures like Captain Cold (with his raygun), Blue Beetle (with his raygun), Barda (with her mega-rod) and Aquaman (with his funky trident) add in one additional accessory, and this obviously boosts their score. I really like both Cold's and Beetle's guns, and they fit perfectly in the provided holsters. Beetle can hold his in either hand, but Cold can only use his right, and the fit is pretty loose. Barda comes with her 'mega-rod'. I don't understand the need for comic book writers to give their female characters such obvious phallic accouterments, but at this point it's really no surprise. Hey, at least the sculpt is good, and it fits nicely in her, uh, hands. Aquaman has his golden trident, designed to fit in both hands. The sculpt is great, but I do have some issues with excessive mold lines and flashing left from the manufacturing process. Also, the paint work could be better with some of the sculpt details brought out with paint. It's a nice staff, but it certainly could have been better with just a little more effort. When you ignore the CnC piece, and take in to consideration the price tag, just one accessory (even a cool one) isn't enough to get these three guys an above average score in this category. Atom Smasher gets a big bupkis no matter what, since there is nothing useful for him. Yea, Flash has a 'stand' for him, but you don't need it, there's nothing special about it, and you'll just toss it in a box. Like Mattel's Masters of the Universe Classics line, these figures are GREAT toys. They get even better when you take away the quality issues with the paint and articulation. Kid's might not know who half these characters are (actually, it's probably more like 80%), but at least these figures remember their roots. They're great toys first, collectibles second. Ten bucks a pop is what the going rate these days is for just about any mass market figure in this scale, and what you're getting here is a well articulated, well sculpted, well painted figure in the average price range. Therefore, an average value score that does little to hurt or help my overall is probably not too surprising. Aquaman scores the lowest for me, since he has the most basic re-use for the price point. Keep your eyes peeled for the occasional sloppy paint job, but this should be much less of an issue with this wave. From the few I've seen, the quality has improved in this area overall. I'm very, very happy with this wave, because both the Paint and Articulation show improvements. The BAF was well done too, and had the paint ops been just a bit better on Atom Smasher, he would have been a four star figure. I'm not a huge fan of the Booster Gold or Blue Beetle characters, but I gotta say that these two representations look terrific on the shelf. I was particularly surprised by how much I like Booster Gold, a figure I thought would be too over the top and gaudy looking. 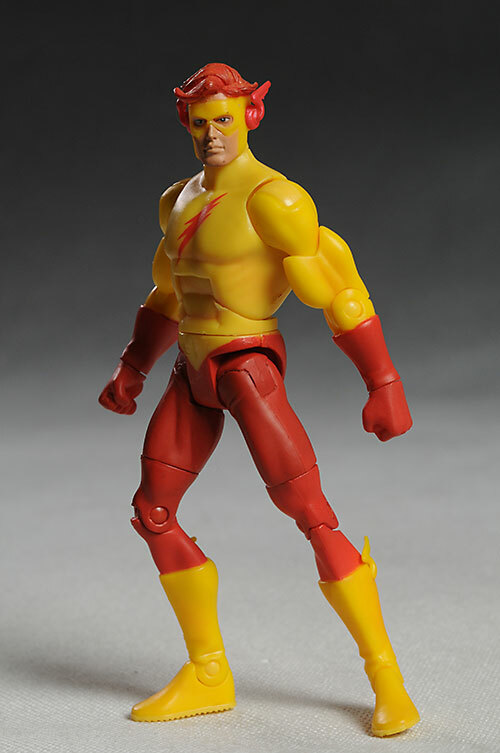 Even Flash, who is a very basic figure, turned out exceptionally well. My only real disappointments here is the simple repainted Aquaman, who isn't a bad figure, just not one you really need, and the undersized Captain Cold. Fortunately, the good Captain makes up for his small size with some really nicely done paint and sculpt details. Wave 8 (which includes the much anticipated Hawkgirl) has already been spotted in the Philippines, so they should be in the States within the next couple weeks. I'm hoping that the improved quality I'm seeing with this wave will continue with future releases, and we won't have long to wait to find out. 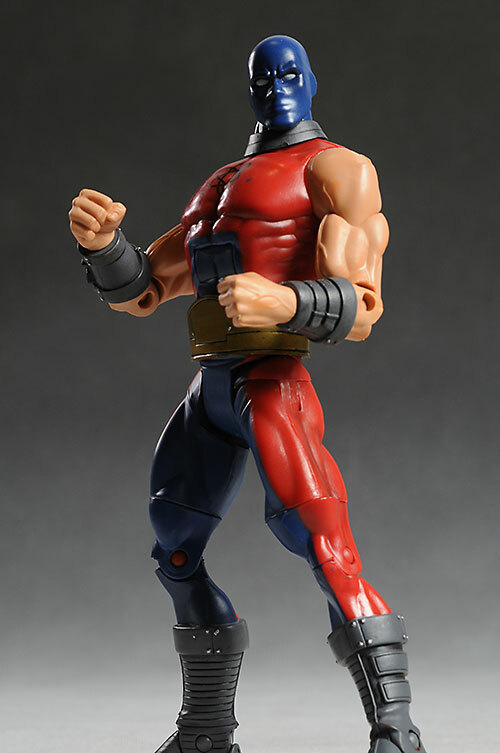 - has them in stock including Barda for $13.5 each. - has a bunch of the singles in stock at $15 each. - Entertainment Earth has singles for around $14 each. - I broke wave six into two reviews, one here and one here. - no, I never reviewed wave 5, but prior to that was wave 4 which I also broke into this review, and this one. - of course, prior to that was wave 3. - I covered wave 1 in two parts, one here and one at here. It took me so freakin' long to find them, I never did review wave 2, but if you're looking for one, Kastor's Korner has a great review.